1844: John Fremont’s journal of camping at the Las Vegas Springs brings publicity to the area. 1855: Mormons make first attempt to settle Las Vegas. Oct. 31, 1864: Nevada is admitted as the 36th state in the Union. 1902: U.S. Sen. William Andrews Clark looks to connect transcontinental railroad through Las Vegas. May 15, 1905: Clark auctions off 600 plots of land, establishing Las Vegas as a town. 1905: The First United Methodist Church of Las Vegas is formed. 1906:What is now the Golden Gate Hotel & Casino opens as the Hotel Nevada in downtown Las Vegas. 1907: First telephone wires installed on Fremont Street. July 1, 1909: Clark County is created. March 16, 1911: The city of Las Vegas is incorporated. 1911: Laws liberalized to allow for “quickie” divorce after six weeks of residency. 1919: Prohibition is ratified — all consumption, manufacturing and distribution of liquor banned. 1920: Population of Las Vegas is 2,304 (Clark County, 4,859). Nov. 24, 1922: Colorado River Compact is signed by seven western states to divide water equally. 1925: Fremont Street is paved. April, 1926: Western Airlines provides first commercial flight at Rockwell Field. Dec. 21, 1928: The Boulder Canyon Project Act approved, authorizing construction of a dam on the Colorado River. 1928: The El Portal Theatre opens on Fremont Street. Sept. 7, 1929: Work starts on Boulder Dam. 1929: The Las Vegas Review-Journal becomes a daily newspaper. 1929: Las Vegas High School opens. 1930: Population of Las Vegas is 5,165 (Clark County, 8,532). 1930: Union Pacific Railroad connects Las Vegas to Boulder City. 1931: The Nevada Legislature relaxes marriage and divorce laws and repeals its gambling ban. 1931: Pair-O-Dice Club opens on Highway 91, which later is known as the famous Las Vegas Strip. 1934: “Helldorado Days” begin, portraying the city’s Old West theme. Sept. 30, 1935: President Franklin Roosevelt dedicates Boulder Dam. 1938: California authorities crack down on illegal gambling, causing many gamblers to move to Las Vegas. 1938: Guy McAfee opens “The 91 Club” on Highway 91. 1940: Population of Las Vegas is 8,422 (Clark County, 16,414). Jan. 25, 1941: U.S. Army creates a gunnery school that will become Nellis Air Force Base. April 3, 1941: Thomas Hull opens the El Rancho Vegas, the first resort on Highway 91 (aka the famous Las Vegas Strip). 1941: The El Cortez opens downtown. Oct. 30, 1942: The Last Frontier opens. Oct. 10, 1944: The Huntridge Theater opens as the first non-segregated theater in Las Vegas. Nov. 1944: Liberace makes his Las Vegas debut. 1945: J. Walter Thompson receives first advertising contract to promote Las Vegas tourism. Aug. 30, 1946: The Golden Nugget opens downtown. Dec. 26, 1946: Benjamin “Bugsy” Siegel opens the Flamingo Hotel. 1946: Nevada levies first gaming taxes. June 20, 1947: Siegel is murdered in Virginia Hill’s Beverly Hills home. Dec. 20, 1948: Alamo Airport becomes McCarran Field — now known as McCarran International Airport. April 24, 1950: Desert Inn opens. July 1, 1950: Hank Greenspun publishes the first edition of The Las Vegas Sun under the name of the Las Vegas Morning Sun. Nov. 15, 1950: Sen. Estes Kefauver opens a five-month probe of organized crime with a hearing in Las Vegas. 1950: Population of Las Vegas is 24,624 (Clark County, 48,289). Jan. 27, 1951: Nevada Test Site conducts first nuclear weapons test only 65 miles from downtown Las Vegas. Sept. 1951: Frank Sinatra’s first performance at the Desert Inn. 1951: Vegas Vic, a 40-foot tall waving cowboy sign, is erected at the Pioneer Club. April 22, 1952: Media broadcast detonation of a nuclear device for the first time. Oct. 7, 1952: Sahara opens. Dec. 15, 1952: Sands opens as the seventh resort on The Strip. July 22, 1953: Greenspun and other investors start KLAS Ch. 8, the city’s first commercial TV station. Sept. 4, 1953:Las Vegas Park opens but horse racing lasts only 13 ill-fated days. Feb. 15, 1954: Ronald Reagan has two-week show at the Last Frontier. April 28, 1954: Roxie’s, a bordello off Boulder Highway, is raided. Sept. 28, 1954: Sen. McCarran dies. March 29, 1955: The Nevada Tax Commission creates the Gaming Control Board. April 20, 1955: The nine-story tall Riviera opens as the tallest building in town. May 15, 1955: Las Vegas celebrates its 50th birthday. May 23, 1955: The Dunes opens, as the 10th resort on The Strip. May 24, 1955: The Moulin Rouge, the first racially integrated hotel opens. Nov. 17, 1955: 14 die when a plane crashes into Mt. Charleston. 1955: The Las Vegas Sun’s starts its Youth Forum. 1955:Liberace becomes the city's highest-paid entertainer, earning $50,000 a week. 1955: Nearly eight million people visit Las Vegas every year. April 23, 1956: Elvis Presley performs first shows in Las Vegas at the New Frontier Hotel. May 18, 1956: The 12-story tall Fremont Hotel opens in downtown becoming the area’s tallest building. 1956: Las Vegas annexes a mile of land, its first addition since incorporation. June 1, 1956: Nellis Air Force Base becomes the home of the Thunderbirds, an aerial demonstration squadron. June 8, 1956: Silver Palace, Las Vegas' first two-story club, opens. Jan. 10, 1957: Showgirls make debut with “Minsky’s Follies” at the Desert Inn. April 3, 1957: Tropicana opens. Sept. 10, 1957: UNLV holds its first classes. March 30, 1959: Nevada creates the Gaming Commission. April 29, 1959: The Las Vegas Convention Center opens. 1959: Betty Willis designs “Welcome to Fabulous Las Vegas” sign. 1960: Rat Pack (Frank Sinatra, Dean Martin, Sammy Davis Jr., Joey Bishop and Peter Lawford) performs for first time. March 25, 1960: NAACP members, politicians and businessmen lift Jim Crow restrictions. June 17, 1960: El Rancho goes up in flames. Aug. 10, 1960: "Ocean’s Eleven," starring the Rat Pack, debuts. March 1963: McCarran Airport completes expansion and relocation project. Oct. 10, 1963: Atomic Age ends when Limited Test Ban Treaty goes into effect, banning above ground testing at the Nevada Test Site. Nov. 20, 1963: The Las Vegas Sun's newspaper office burns to the ground. 1963: Wayne Newton performs first show at the Flamingo. May 20, 1964: The film “Viva Las Vegas,” starring Elvis Presley and Ann Margret, is released. June 3, 1964: UNLV holds first commencement ceremony as 29 students graduate in the “Centennial Class” as Nevada turns 100. Aug. 20, 1964: The Beatles perform at the Las Vegas Convention Center. Aug. 25, 1964: A rooftop fire causes $1 million in damage to the Sahara. April 1, 1966: The Aladdin opens with 400 rooms. Aug. 5, 1966: Caesars Palace opens. Nov. 27 1966: Howard Hughes arrives in Las Vegas and takes over the top two floors of the Desert Inn. Jan. 7, 1967: R.J. Parish kills six people — including himself — and injured eight others by shooting a pile of dynamite at the Orbit Inn Motel. March 1967: Hughes buys the Desert Inn (avoiding eviction), the first in a slew of hotels the billionaire would purchase. 1967: Siegfried & Roy debut at the Tropicana. May 1, 1967: Elvis and Priscilla Presley marry at the Aladdin. 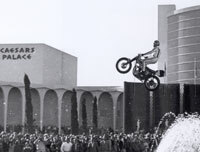 Dec. 31, 1967: Evel Knievel crashes during his famous jump over the fountains at Caesars Palace. 1967: The first Las Vegas Marathon takes place. Oct. 18, 1968: Circus Circus opens. 1969: The Nevada Legislature approves its second Gaming Act, allowing corporations to own casinos. 1969: Kirk Kekorian builds the International Hotel. July 26, 1969: Elvis Presley starts his shows at the International, signing up for four weeks, twice a year, for $125,000 per week. 1969: B.B. King plays first show in Las Vegas at Caesars Palace. Nov. 26, 1970: Howard Hughes leaves Las Vegas after becoming Nevada’s largest private employer, largest casino owner and largest property owner. 1971: The $3.5 million Las Vegas Stadium opens. 1971:Hunter S. Thompson first publishes "Fear and Loathing in Las Vegas" as a story in Rolling Stone. April 5, 1976: Howard Hughes dies. Dec. 2-12, 1976: Elvis performs his final engagement at the Hilton. 1976: Gambling is legalized in Atlantic City, N.J., providing intense East Coast competition. Aug. 16, 1977: Las Vegas legend Elvis Presley dies in Memphis. April 15, 1979:Liberace opens The Liberace Museum, which displays his collection of rare pianos, cars and, of course, his bejewled wardrobes. Jan. 31, 1979:A winter storm blanketed the valley with 7.4 inches of snow (The record snow for Las Vegas was 9 inches in January of 1974). Nov. 21, 1980: The MGM Grand Hotel fire kills 87 people and injures some 700 more. Feb. 10, 1981: The former International, known as the Las Vegas Hilton, erupts in flames, killing eight. Oct. 4 1982: Frank “Lefty” Rosenthal survives near fatal car bomb explosion. 1985: The first National Finals Rodeo is held in Las Vegas. June 14, 1986: Notorious mobster Tony “The Ant” Spilotro is killed in an Indiana cornfield. Feb. 4, 1987: Liberace dies. 1987: McCarran International Airport completes a $300 million expansion project that features a new central terminal, additional gates, and revamped runways. May 4, 1988: The Pacific Engineering Production Company plant explodes in Henderson, killing two and injuring 370. Nov. 22, 1989: Steve Wynn opens the Mirage (the first new casino in 16 years) which ignites a resort building boom that revolutionizes Vegas into the 1990s and 2000s. Jan. 15, 1990: The Rio opens. April 9, 1990: UNLV’s basketball team wins national title with a 103-73 victory over Duke in Denver. May 16, 1990: Rat Pack member Sammy Davis, Jr. dies from complications of throat cancer in Beverly Hills, Calif.
June 19, 1990: Excalibur opens. Dec. 18, 1992: The first Las Vegas Bowl is played at Sam Boyd Stadium. Jan. 26, 1993: The Dunes closes its doors after being sold to Steve Wynn. The famed casino is imploded on Oct. 27. Oct. 15, 1993: The Luxor opens. Oct. 27, 1993: Treasure Island opens. Dec. 18, 1993: Kirk Kerkorian’s MGM Grand Hotel & Theme Parks opens at the world’s largest hotel at a cost of $1 billion. March 10, 1995: The world’s first Hard Rock Hotel opens in Las Vegas. Dec. 14, 1995: The $70 million Fremont Street Experience opens. Dec. 25, 1995: Former Rat Pack member Dean Martin dies of lung cancer. April 30, 1996: The Stratosphere Hotel opens as the tallest building west of the Mississippi. June 21, 1996: Monte Carlo opens. Sept. 1996: The $72 million, 1,100-acre Las Vegas Motor Speedway opens. Sept. 7, 1996: Tupac Shakur is shot; dies six days later. Sept. 7, 1996: UNLV becomes a member of the Western Athletic Conference. Nov. 26, 1996: The Sands Hotel is imploded. Dec. 18, 1996: The Orleans opens. Dec. 31, 1996: The Hacienda is imploded. 1996: Wayne Newton celebrates 25,000th performance. 1996: Siegfried and Roy celebrate their 15,000th performance. Jan. 3, 1997: New York-New York opens. June 28, 1997: Mike Tyson bites Evander Holyfield’s ear. May 14, 1998: Frank Sinatra dies of a heart attack. The next night the lights on the Strip are dimmed in his honor. Oct. 15, 1998: The Bellagio opens as the most expensive hotel in the world, built for $1.7 billion. March 2, 1999: Mandalay Bay opens. May 3, 1999: The Venetian opens. Sept. 1, 1999: The Paris Hotel and Casino opens. Dec. 31, 1999: Barbra Streisand’s New Year’s Eve concert at the MGM Grand becomes Vegas’ highest grossing concert ever. 1999: Las Vegas became the world’s most visited place with 37 million tourists a year. Aug. 28, 2000: The Desert Inn closes after Steve Wynn buys the property. It is then imploded Oct. 23, 2001. Nov. 15, 2001: The Palms Casino opens off the Strip. Dec. 18, 2001: Green Valley Ranch opens. Sept. 3, 2002: Nevada State College opens. 2002: Lake Mead completes its second water intake. 2002: The Las Vegas band, The Killers, form. March 21, 2003:A record Megabucks jackpot of $39,713,982.25 was won by a 25-year-old software engineer from Los Angeles. July 15, 2004: The Las Vegas Monorail opens to the public. 2005: Las Vegas celebrates its centennial. April 28, 2005: Wynn Las Vegas opens with 2,698 rooms. Dec. 22, 2005: South Coast Hotel & Casino (now South Point) opens. 2005: Harrah’s Entertainment became the world’s largest owner/operator of casinos after purchasing Caesars Entertainment. Feb. 3, 2006: Hooters Casino Hotel (formerly the San Remo) opens. April 18, 2006: Red Rock Casino opens. July, 19 2006: An ordinance makes it illegal to serve homeless people food in any Las Vegas park. Feb. 18, 2007: Las Vegas hosts NBA All-Star Weekend. March 13, 2007: The Stardust is imploded. July 7, 2007: On what is billed as the luckiest day of the century, hundreds of couples tie the knot. Sept. 13, 2007: O.J. Simpson is arrested in an alleged armed robbery at the Palace Station casino. Oct. 30, 2007: Robert Goulet dies. Nov. 2007: The Aladdin reopens as Planet Hollywood. Nov. 13, 2007: The New Frontier is imploded. December 2007: Clark County’s population reaches 2 million. Jan. 17, 2008: The $1.9 billion Palazzo resort opens. Combined with The Venetian the resorts boast more than 7,000 rooms. Jan. 25, 2008A roof fire on top of the Monte Carlo causes severe damage, but no deaths. February 2008: The largest hepatitis scare in the nation occurs in southern Nevada. March 22, 2008: The eighth-seeded UNLV Rebels make it to the second round in the NCAA Final Four men's basketball tournament under coach Lon Kruger. March 30, 2008: The Sun begins its series on construction deaths during the $32 billion building boom on the Strip, exposing serious safety flaws and how lax oversight by safety regulators failed to prevent accidents that caused 12 deaths in 18 months. The Sun eventually wins the Pulitzer Prize for Public Service for the series. Aug. 13, 2008: Nevada finding itself at ground zero of the nation's foreclosure crisis. Aug. 28, 2008:The $250 million Eastside Cannery opens its doors, becoming the first new casino property along Boulder Highway in 14 years. Sept. 18, 2008:The Los Angeles Dodgers leave Las Vegas as the parent team for the Triple-A 51s, moving to Albuquerque. The Toronto Blue Jays become the 51s' new parent club. Nov. 4, 2008: Barack Obama wins the presidency in the 2008 general election, taking Nevada by 12 percentage points over Republican John McCain. The Democratic surge also topples two longtime GOP state senators, Bob Beers and Joe Heck. 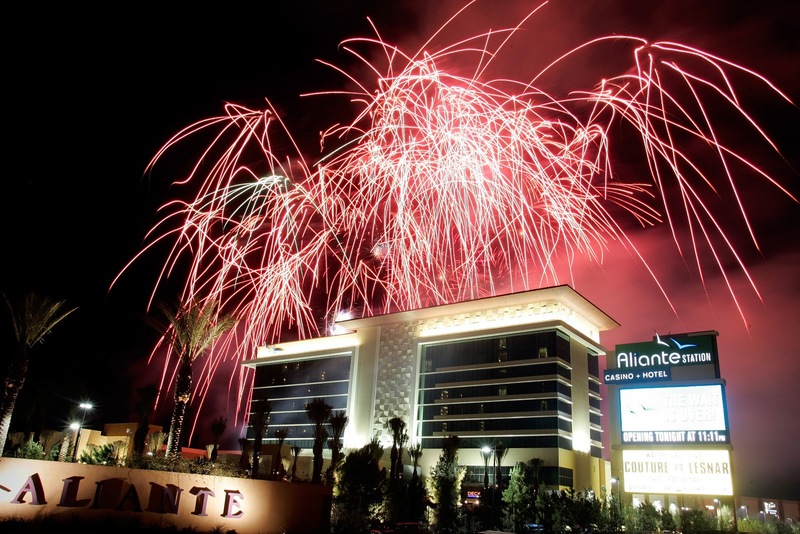 Nov. 11, 2008:The $662 million Aliante Station Casino and Hotel opens in North Las Vegas. Dec. 4, 2008: O.J. Simpson is sentenced to at least nine years in prison for an armed sports memorabilia Sept. 13, 2007, robbery at the Palace Station casino. Dec. 22, 2008: The $2.3 billion Encore opens next to its sister property, Wynn Las Vegas, bringing another 2,034 hotel rooms to the Las Vegas Strip. Jan. 7, 2009: Because of structural building problems, MGM Mirage announces it will stop work on the condo project part of the Harmon Hotel and Spa. Jan. 12, 2009: Caesars Palace delays opening of new 660-room Octavius Tower. Feb. 12, 2009:Nevada is named the worst state in the country for foreclosures. Another report in August showed foreclosures were the highest in the country for the 31st month. March 1, 2009:The M Resort opens on 90 acres near Interstate 15 and St. Rose Parkway as the Las Vegas Valley's newest locals-oriented resort and casino. May 1, 2009:Danny Gans, a longtime Las Vegas impressionist, singer and comedian, suffers an accidental death, later found to be caused by by a combination of medical ailments and a prescription painkiller. June 16, 2009:U.S. Sen. John Ensign, R-Nev., once considered a possible presidential contender, admits to an affair with the wife of his former upper-level staffer, triggering a scandal that lasts for months. A $96,000 gift from his parents to the staff member, who critics characterized as hush money, leads to an investigation by the Senate Ethics Committee. Oct. 9, 2009: Cloud Nine, a tethered balloon ride across from Mandalay Bay, opens. Nov. 30, 2009: Binion's Gambling Hall and Hotel announces it will close its 365 hotel rooms on Dec. 14 and lay off about 100 workers. It also closes the Binion's Original Coffee Shop and discontinues keno. The casino, sports book, poker room and Binion's Ranch Steakhouse on the property's 24th floor will stay open. 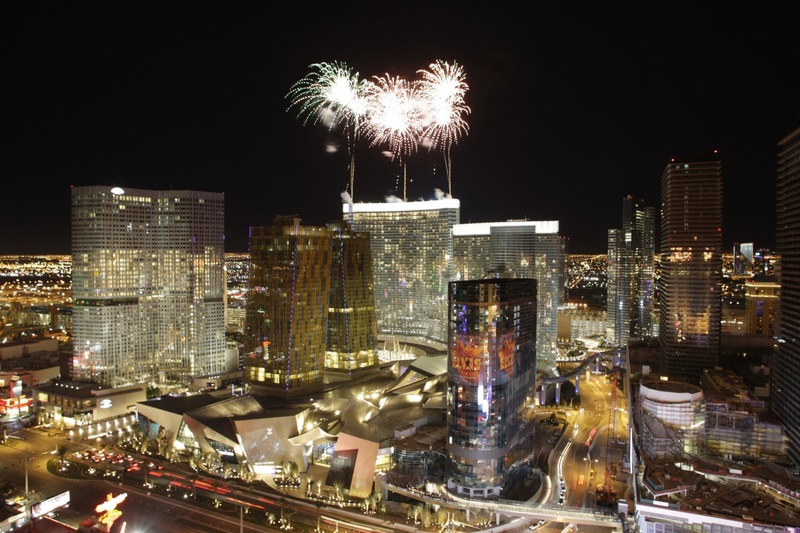 Dec. 1, 2009: MGM Mirage's $8.5 billion CityCenter complex opens with the ribbon-cutting of the non-gaming, 1,495-room Vdara Hotel and Spa. 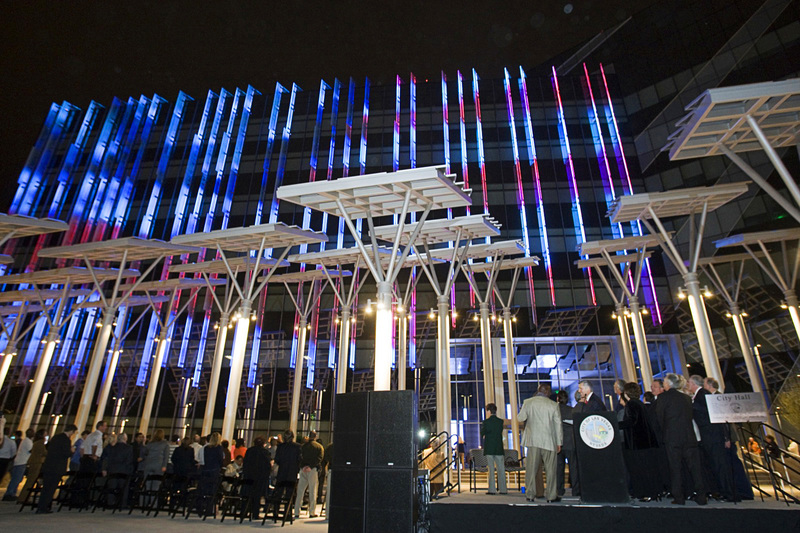 Dec. 3, 2009: Crystals, a 500,000-square-foot retail and entertainment district featuring high-end shops and restaurants, makes its debuts as part of the CityCenter complex. Dec. 4, 2009:The Mandarin Oriental, a 47-story non-gaming hotel and condo development that's part of the CityCenter complex, is opened to the public. Dec. 16, 2009:Aria Resort and Casino, the 4,004-room centerpiece of the CityCenter complex — and the only casino component to MGM Mirage's mid-Strip metropolis — is is finally unveiled. Dec. 17, 2009:Cloud Nine, a tethered balloon ride across from Mandalay Bay, closes. Dec. 28, 2009:The Hard Rock Hotel and Casino's new all-suite HRH Tower welcomes its first guests. The tower includes 359 suites, seven penthouses and eight spa villas. Jan. 4, 2010:Johnny Lee Wicks walks into the Lloyd D. George Federal Courthouse in downtown Las Vegas, pulled a shotgun from beneath his jacket and opened fire, killing Stanley Cooper, a security guard, before being killed in a gunfight with deputy U.S. marshals. Jan. 13, 2010:The Las Vegas Monorail files for Chapter 11 bankruptcy protection, but will continue to operate. Feb. 19, 2010:Harrah's officially takes over Planet Hollywood. April 20, 2010: The Stratosphere debuts the $99 SkyJump thrill ride. May 21, 2010: The Cleveland Clinic Lou Ruvo Center for Brain Health opens, bringing world-class medical research to Las Vegas. June 1, 2010:Barbara Greenspun, matriarch of the Greenspun Media Group and the Las Vegas Sun, dies at the age of 88. She took over as publisher of the Sun when her husband, Hank Greenspun, died in 1989. July 10, 2010:Eric Scott, 38-year-old U.S. Military Academy graduate, was killed in a hail of gunfire by three Metro police officers outside the Costco store in Summerlin. Store employees told police that Scott was acting as if he was on drugs and had refused to leave when he was seen carrying a handgun. A coroner's inquest found the police to be justified in the shooting. However, the incident prompted changes in the inquest process. 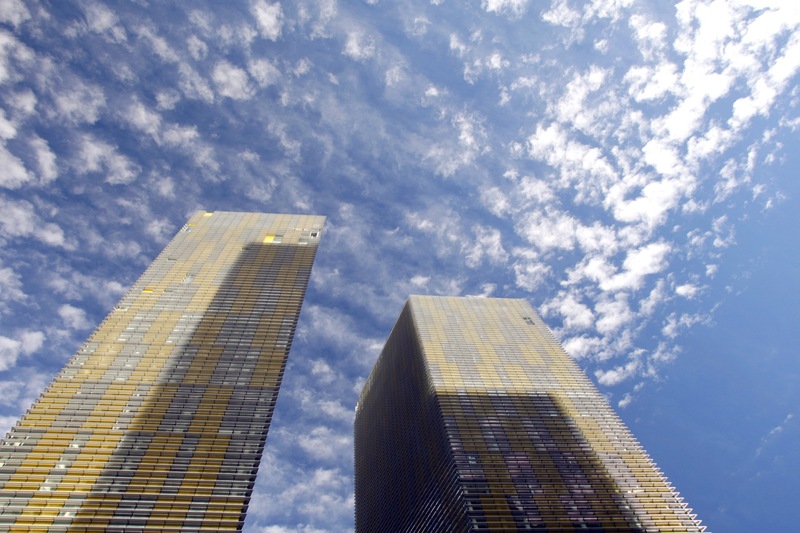 July 15, 2010:The 37-floor Veer Towers, the last of the residential buildings at the CityCenter complex, officially welcomes its first residents. July 22, 2010:Former Nevada Gov. Kenny Guinn, a Republican, dies when he falls off the roof of his Las Vegas home. July 22, 2010:Mandalay Bay wins the right to evict the Rumjungle nightclub and the club is closed. Aug. 27, 2010:Hotel heiress and TV reality star Paris Hilton is arrested on drug charges for having 8 grams of cocaine in her purse outside of Wynn Las Vegas. She serves a year of informal probation and does community service work. Sept. 13, 2010:The Plaza Hotel and Casino announces it will temporarily lay off 400 employees as it begins a renovation project on all of its guestrooms and hallways. Sept. 30, 2010:Hollywood leading man Tony Curtis dies at his Henderson home at the age of 85. Curtis, whose work ranged from light comedies such as "Some Like It Hot" to dramas such as "The Defiant Ones," also portrayed Strip casino-resort owner Philip Roth on the TV show "Vega$" from 1978 to 1981. Oct. 20, 2010:The 1,900-foot Hoover Dam bypass bridge is open to traffic above the Colorado River. The bridge, whose official name is the Mike O’Callaghan-Pat Tillman Memorial Bridge, is the largest single-span concrete arch bridge in the western hemisphere. Nov. 2, 2010:U.S. Senate Majority Leader Harry Reid, D-Nev., survives an anti-incumbent wave to win re-election over Republican Sharron Angle, a Tea Party movement favorite. U.S. Rep. Dina Titus, D-Nev., loses her re-election bid to Republican Joe Heck. Nov. 9, 2010:Tropicana Las Vegas implodes a wing containing the resort's oldest rooms. 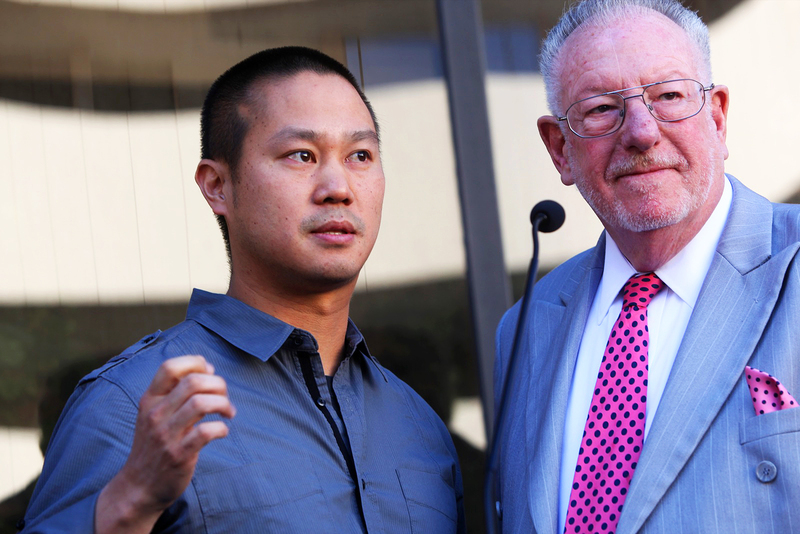 Dec. 1, 2010:In what Mayor Oscar Gooman calls a "watershed moment" for Las Vegas, city officials announce that Zappos.com will move into the former City Hall building at Fourth Street and Stewart Avenue. Dec. 8, 2010:The downtown Lady Luck property owners announce renovations for the mothballed casino and hotel. Dec. 14, 2010:Metro Police search for the "Bellagio bandit" who robbed a craps table at gunpoint and got away on a motorcycle with about $1.5 million in casino chips. The same man also robbed the Suncoast Casino on Dec. 9 of just under $20,000 in cash. Dec. 15, 2010:The $3.9 billion, 2,995-room Cosmopolitan of Las Vegas casino/resort opens its doors to the public on 8.7 acres between the Bellagio and the CityCenter complex. Jan. 13, 2011:The Stratosphere unveils its $20 million renovation. Feb. 2, 2011:The 70-year-old El Cortez, a downtown stalwart hotel and casino, takes aim at a younger crowd with revamped suites. Feb. 9, 2011:Executives say still no plans in place for the stalled Fontainebleau project on the Las Vegas Strip. March 7, 2011:A plan is announced to revamp the existing Centurion Tower at Caesars Palace into the 180-room luxury Nobu Hotel, featuring "signature Japanese elegance." March 10, 2011:Station Casinos reaches agreement to buy Green Valley Ranch hotel-casino in Henderson. April 21, 2011:Sen. John Ensign announces his resignation following months of scandal; Dean Heller to be his replacement. May 2011:O'Sheas closes after 23 years. The casino parking garage for O'Sheas is imploded, getting ready for the new Linq entertainment district, which will fold in O'Sheas and the Imperial Palace under a new name. May 15, 2011:After 59 years, the 1,720-room Sahara hotel-casino has its last weekend. Company officials reviewing options, including renovation. May 27, 2011:Tropicana's $180 million renovation is highlighted by a Nikki Beach theme five-acre pool area and nightclub and a 26,000-square-foot "Las Vegas Mob Experience" attraction. May 31, 2011:Phil Ruffin takes aim at the mid-range income crowd in his renovation of Treasure Island. Aug. 25, 2011:Anthony Carleo, the son of a local judge and the admitted "Bellagio bandit," is sentenced to serve at least nine years in state prison. Sept. 1, 2011:Following nine months of renovations, costing $35 million, the 1,037-room Plaza hotel-casino reopens in downtown Las Vegas. Nov. 15, 2011:The Western Hotel and Casino closes after operating 41 years downtown. Dec. 16, 2011:Caesars Palace opens Octavius Tower with "a hotel within a hotel" feel. Jan. 4, 2012:The Bellagio finishes a $70 million renovation of 2,568 rooms in the hotel's main tower. Feb. 14, 2012:The Mob Museum opens in downtown Las Vegas. March 5, 2012:The glassy new Las Vegas City Hall opens, clearing the way for Zappos to begin renovations on the old city hall building. March 10, 2012:The Smith Center for the Performing Arts opens in the downtown's new Symphony Park development. March 13, 2012:The downtown's Fitzgeralds becomes the D Las Vegas Casino Hotel as part of a makeover and a $15 million renovation. April 4, 2012:The Sahara will be reopened as "SLS Las Vegas." May 22, 2012:Construction begins on SkyVue, a 500-foot observation wheel on the Strip. July 15, 2012:The Sun takes a comprehensive look at four major proposals to build a sports arena in Las Vegas: on the Strip, at UNLV, downtown Las Vegas and southwest Henderson.